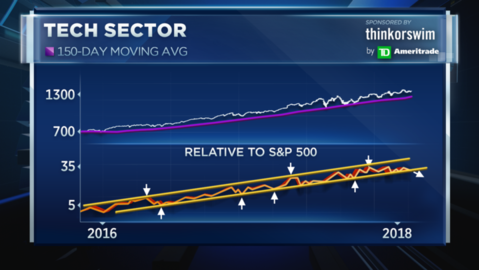 As the markets work their way back to record territory, one top technician warns of looming pain for this year's best performing sector: technology. The tech sector has been on a winning streak this year, up more than 18 percent — double that of the broader S&P 500's gain of 9 percent However, Carter Worth, head of technical analysis at Cornerstone Macro, warns that several technical indicators suggest the group is now heading for a major pullback. The XLK ETF which tracks the tech sector, has gained nearly 58 percent in the past two years as investors have piled into the group's top holdings like Apple, Microsoft and Alphabet. Despite the run-up, Worth's charting suggests tech's big rally is beginning to show signs of a slowdown. 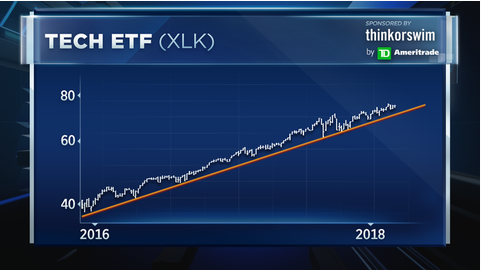 "Essentially [the XLK is] not progressing and the relative performance is down, even as [it] makes new highs," he said Friday on CNBC's "Options Action." "So the problem with that is it's still crowded and yet it's no longer paying. ... It's no longer the reward that one would think." One hot space within the tech sector lies in the semiconductor stocks, which make up nearly 13 percent of the tech ETF and have been led by names like Advanced Micro — which has soared more than 100 percent since January as this year's best performing tech stock. 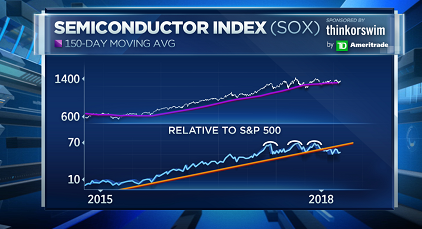 Yet Worth notes that the broader SOX semiconductor ETF, which tracks the chip names, has also breached below is trend line, indicating a potential breakdown for the broader tech group. Shares of the XLK jumped to a fresh all-time high of $75.77 back in August, but have since pulled back from the highs and is now on track for it's worst monthly performance since March. Worth noted that while the XLK ETF is still trading above its 150-day moving average, relative to the S&P 500 the sector is now poised to break below a key uptrend level. "We have literally lived perfectly in this channel over and over and over," Worth said. "We are on the cusp of breaking for the first time in two years, [that's] not a good circumstance." "At the minimum I think we go back to this channel, that implies another 5 percent," he cautioned. "I want to be short XLK, take profits if you're long." The XLK Tech ETF was trading higher on Monday afternoon around $74.74.